Week 1 is done…and neither of us arrowed a deer. 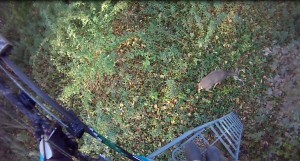 I had a nice opportunity at a 2 1/2 year old buck but he was a big 4-point and I decided to let him walk (see below). I’ve seen a few others over the past month that I would rather shoot so I’m taking my chances and hoping for another opportunity. Rich saw very few deer on his property…that is not typical. He usually sees more deer than me so that’s not a good start to the season. There is another guy who hunts the property that Rich is on and he shot a 7-point last week. Hopefully this week will pick up for Rich. I scouted on my mountain bike on Sunday…my typical state land spot in Midland County. No water, no acorns, no deer sign. I ran into a couple other guys who were biking it too and they were also disappointed with the deer sign and lack of sightings while hunting. This entry was posted in News and tagged archery, bowhunting, buck, deer, hunting, Michigan, photo, update by Quinn Keon. Bookmark the permalink.